The sun is shining, we are one step closer now… tomorrow we fly! Tensions were high as we waited to hear if the Matane-Godbout ferry would run after the cancelled crossing yesterday. At 6 am we were relieved (an understatement!) to hear that everything is back on schedule. We threw everything in the truck and raced down to the ferry terminal. We were greeted by a huge ribbon of cars, transport trucks and every style of snowmobile-toting rig one can imagine. Many vehicles had turned up extra early to ensure boarding after not being able to travel yesterday. A new worry presented itself….the boat looked big from where we were at the far reaches of the parking lot, but was there room for us? A normally rational mind can instantly fill itself with dramatic visions of being the last vehicle in line and just one too many to fit. Hyper thinking commences: we start crunching numbers of kilometres to cover if we had to drive all the way around, how fast we can drive, we can move our flight, move our arrival to St. Augustine by a day, use our one and only storm day for the first leg of the expedition to cover the glitch, no problem, it will be ok, right? Right!? Yes it will, no it won’t, yes it will…..and then we are summoned to load onto a boat that is less than half full. Feeling silly and grateful, we park and start to explore the beautiful, brand new ferry. Just as we are starting to unwind, yet one more concern presents itself: a tanker having left the Matane harbour is stuck, just beyond the break wall in what appears to be an impenetrable mountain of sea ice. There is a palpable nervous twitter among the passengers that have gathered on the observation deck as the MV F.-A.-Gaulthier begins to slowly attack the barrier. Back and forth, back and forth we wonder with every slow motion backwards retreat if we are just going to dock and be told to disembark. 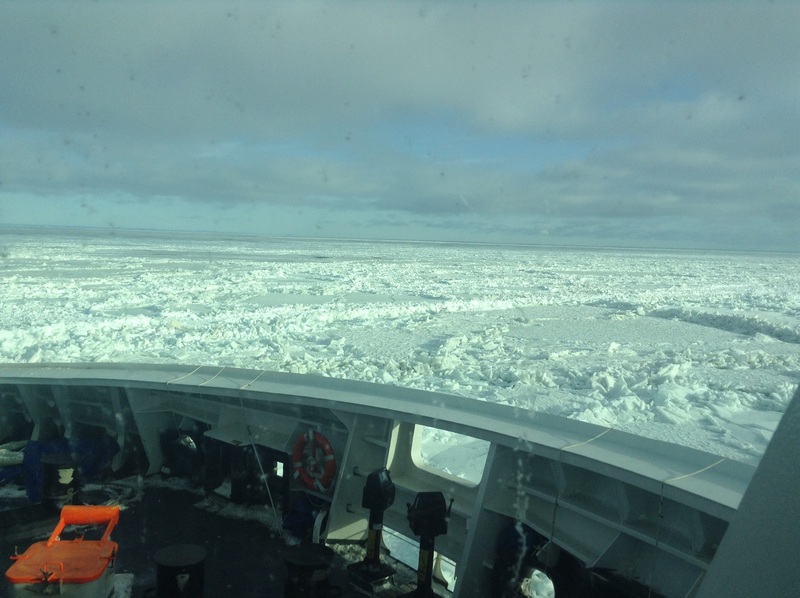 No matter, the captain clearly has a strategy and eventually after a fairly tense half hour, the boat punches into the flow of the ice-covered Fleuve St. Laurent to the cheers of everyone on board. After almost two hours the far shore, the beginning of the Basse Cote Nord becomes clear. As long as we can dock, we will be one step closer to the remote outpost we will start our trip from. Although, in reality the changing weather, road conditions and now sea ice have reminded us that our trip started as soon as we pulled out of our driveway in the Gaspereau Valley.